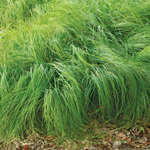 A compact sedge good for wet areas and as an accent plant in small gardens. Though it is wind-pollinated, yellowfruit sedge and other sedges feed many caterpillars and other foliage-munching insects. Birds will love the seeds.